“Wagon Wheel, Lg.” was stamped on Ninja Confetti card stock. 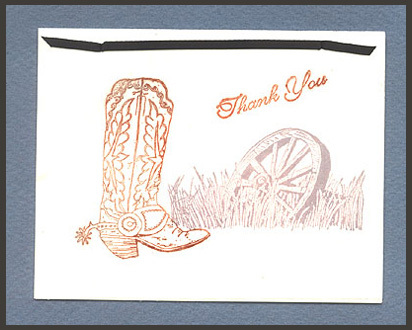 “Cowboy Boot” and “Thank You #2” were stamped on vellum and secured to the Confetti card stock with a ribbon woven between two holes punched near the top fold of the card. Card by Lee Ann Atencio. Tags: Cowboy Boot, Lee Ann Atencio, Ribbon, Thank You!, Vellum, Wagon Wheel Lg. “Rose Fan, Lg.” was embossed with purple and colored with markers in shades of coral, purple and autumn orange. A ribbon was tied for the handle. “Happy Birthday” was stamped on white card stock using a lavender Encore pad. A gold metallic pen was used to highlight the roses and the edge of the fan. 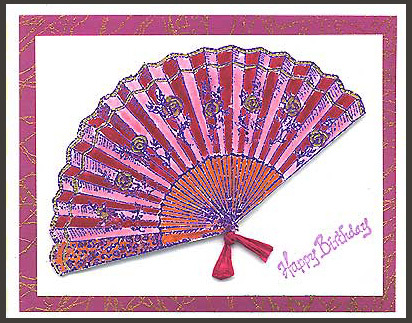 The fan was cut out and mounted with foam dots to the white card stock on which “Happy Birthday” had been stamped. The card was then layered on gold and wine colored background card stock and white card stock. Card by Margaret Wiggin. Tags: Embossed, Foam tape, Happy Birthday, Margaret Wiggin, Markers, Ribbon, Rose Fan Lg. 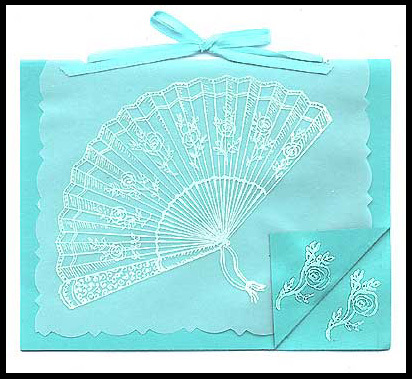 “Rose Fan, Lg.” is embossed in white on the vellum which is cut smaller than the turquoise card stock. “Carved Rose” is embossed on the folded back corner and on the inside lower right corner of the card. Holes are punched through the vellum and card stock and a ribbon is tied in a bow to hold the two together. Card by Margaret Wiggin. “Leaf #1” is embossed in gold on black card stock to make a background. 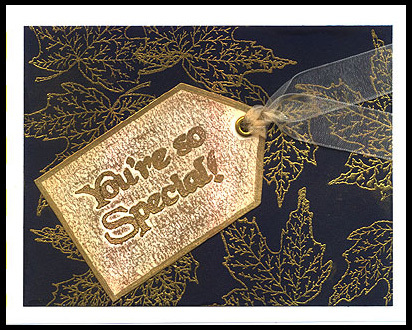 “You’re so Special!” is gold embossed on an ivory tag, a ribbon is attached to the tag, gold rub-on is applied to the tag and it is edged with a Krylon Gold Leafing pen. The tag and the background piece are attached to white card stock as shown. Card by Margaret Wiggin. Tags: Embossed, Krylon Leafing Pen, Leaf #1, Margaret Wiggin, Ribbon, Rub-Ons, Tags, You're So Special! “Snowflake, Lg.” is embossed with white/silver embossing powder on white card stock that has been sponged with Pearlescent Sky Blue and Mediterranean Blue Brilliance ink. Snowflakes from “Snowflake Background” are randomly stamped on the card. One is embossed in white on blue card stock, cut out and layered on the card. Another is stamped on white card stock, bordered with dark blue card stock and layered on the card. MW582-G “Merry Christmas” (Discontinued-email for availability) is stamped in Mediterranean Blue Brilliance ink. Two ribbons are tied around the card to embellish it, one dark blue satin and one light colored sheer. 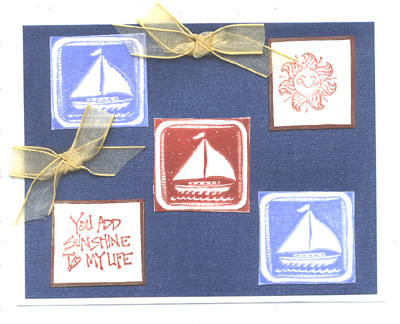 Card by Judy Conklin and Margaret Wiggin. 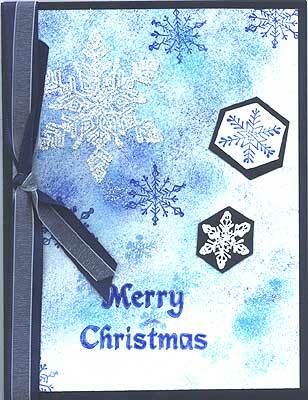 Tags: Embossed, Margaret Wiggin, Ribbon, Snowflake Background, Snowflake Lg. Red satin ribbon is taped across opposite corners in the back of white Kromecoat card stock which is then layered on red and then white Kromekote card stock. “Bold Block Love Hand “ is stamped with Red memories on white card stock, trimmed closely and glued to the left corner of the white card. 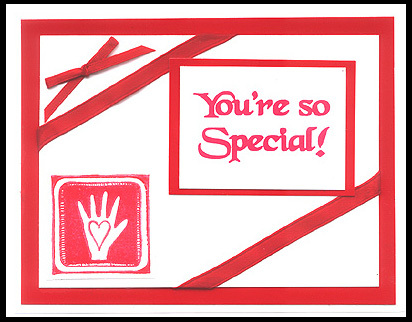 “You’re So Special!” is stamped with red Memories on white glossy card stock which is layered on red card stock and glued to the white card touching the two ribbons. A bow made with narrower ribbon is added in the left upper corner. Card by Margaret Wiggin. Tags: Bold Block Love Hand, Kromekote, Margaret Wiggin, Ribbon, You're So Special! “Bold Block – Celestial Bunny” was embossed in silver on black card stock and trimmed closely. “Follow your dreams!” was stamped with Memories black ink on white Kromecoat card stock which had been edged with a silver Krylon Leafing pen. Two pieces of silver ribbon, each approximately 6″ long, were tied in a square knot and the loose ends were trimmed and taped to the back of the white card stock. This piece was layered on black and white card stock. The embossed “Bold Block – Celestial Bunny” piece was mounted on the card with mounting tape. Card by Margaret Wiggin. 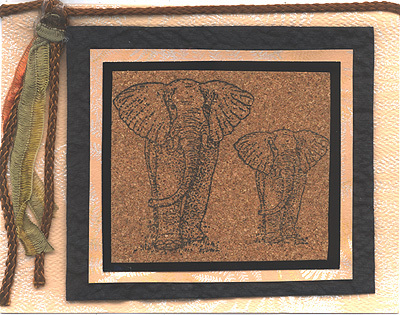 “Elephant, Lg.” and “Elephant, Sm.” are stamped in black Memories on cork which is layered on black glossy card stock, background card stock, black textured card stock and another background card stock which has a cord tied across the top and ribbon added to make a tassel. Card by Judy Conklin.